Everything seemed to go Michael Van Wingerden’s way on Tuesday night as he dominated the field in the caution free Legends Pro Series race. Van Wingerden was a man on a mission as he wasted no time making his way to the front pack and took the lead from Brent Seeley by lap two. Seeley did all he could to try to chase down the high-flying Van Wingerden but came up short at the end. Seeley finished up the night in second as he did all he could to run down Van Wingerden at the end. Michael Van Wingerden won the Thunder Roadster feature, as his brother Thomas clinched the championship. Results: 1. 1. George "Cotton" Spry; 2. Clay Hair; 3. Ryan Weimer; 4. John Barilka; 5. Phil Sharpe; 6. Sam McCullough; 7. Jan Ingram; 8. Dennis White; 9. John Wachter; 10. Todd Johnson; 11. Chuck Dohm; 12. Tom Van Wingerden; 13. Bobby Pence; 14. Chris Carlsen; 15. Jeff Turner; 16. Bill Gardner; 17. Terry Scherz; 18. Carlos Moore; 19. Eddie Harwell; 20. Tim Lightfoot; 21. Dave Winston; 22. Tony Carper; 23. Bill Mathers; 24. Terry Cochran; 25. Randy Thornton; 26. John Sossoman; 27. Dr. Mark Moskowitz; 28. Bill Field. 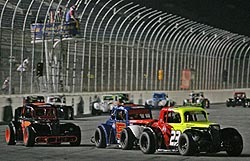 It was an action-packed night of racing in the Legends Semi-Pro division. Kyle Fowler showed he had the right stuff as he worked his way from the fourth-starting spot to the front as he took the lead on lap-nine. Fowler never looked back as it was smooth sailing to victory lane. Although Fowler made it look easy, it took him some time to get his car’s chassis set up the way he wanted. It was a pretty wild night for Jordan Anderson, as he led some of the race early on, but would finished up his night in second. Results: 1. Kyle Fowler; 2. Jordan Anderson; 3. James Buescher; 4. Chris Buescher; 5. Kory Abbot; 6. Casey Dohm; 7. Andrew Carlsen; 8. Brennan Poole; 9. Drew Denham; 10. Jordan Paschal; 11. Chrissy Wallace; 12. Patrick McVay; 13. Trevor Bayne; 14. Matt Bowers; 15. Brandon Weber; 16. Jess Mattox; 17. Darin Coker; 18. Josh Sell; 19. Kory Blevins; 20. Travis Bare; 21. Jessie Johnson; 22. Corey LaJoie; 23. Phillip Gill; 24. Charles Wimbish; 25. Levon Kitchens; 26. Paddy Rodenbeck; 27. Jake Crum; 28. Bryan Silas. Although it was good night for young Brandon McReynolds, it was the track conditions during the race that had him a little upset at the end. Results: 1. Tyler Green; 2. Brandon McReynolds; 3. Mitchell Coble; 4. J.R. Allen; 5. John Ellenburg; 6. Josh Butler; 7. Ryan Glenski; 8. Cole Miktuk; 9. Austin Dillon; 10. Robby Innella; 11. Amanda Harrell; 12. Jake Morris; 13. Kenny Brown; 14. Sloan Henderson; 15. Bailey Freeman; 16. Daniel Goins; 17. Kendall Sellers; 18. William Cunningham; 19. John Stancill; 20. Zac kittle; 21. Ty Dillon; 22. Clay Winters; 23. Rob Beasley; 24. Sam McAulay; 25. 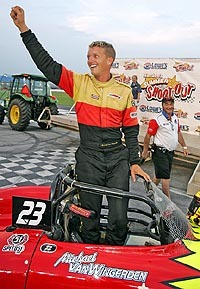 Nick Hoffman; 26. Christopher Moore; 27. Daniel Hemric; 28. Matthew Stover. With numerous cautions flags flying, the Young Guns’ race seemed like it would never end. Tyler Green survived the night though, as he took the checkered flag and earned his fourth win of the season. Green made his move on lap eight for the lead and never looked back. The issue at the end of the race was tack conditions, as many of the drivers complained about the amount of dirt that was kicked up on the track during the race. “It was a tough run,” said Thomas. “I had to fast cars in front of me. 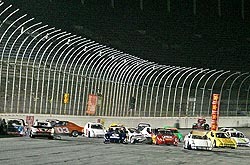 I needed a caution but I am glade to see my brother win. He has had some bad luck lately. Results: 1. Michael Van Wingerden; 2. Ryan Zeck; 3. Thomas Van Wingerden; 4. Kyle Beattie; 5. Roger Simons; 6. Chrissy Wallace; 7. Danny Keaton; 8. Adam Welch; 9. Tom Van Wingerden; 10. Eric Harrington; 11. Jim Gresham; 12. Jon Michael; 13. Hunt Dyer. It was an exciting night for both Van Wingerden brothers as Michael picked up his second win of the night and his second win of the season in the Thunder Roadsters. Michael was tough man to catch, as he took the lead by lap two of the race. Van Wingerden did have to fend off a hard-charging Ryan Zeck and the end to capture the win. Ryan Zeck worked his way from the seventh starting spot to finished up the night in second. Thomas Van Wingeren came from the back to finish up the night with an impressive third-place and clinched his first division title. Thomas did all he could but couldn’t catch Ryan Zeck and his brother Michael at the end but came up short. Beau Slocum would round out the top-three. Results: 1. Michael Van Wingerden; 2. Brent Seeley; 3. Bo Slocumb; 4. Chase Pistone; 5. Jason Reisman; 6. Tolliver Smith; 7. Alex Haas; 8. Ben Stancill; 9. Jessie Bunnell; 10. Louis Hawkins; 11. Chris Eggleston; 12. Tiffany Daniels; 13. Jeremy Colangelo; 14. Jeremy Kalina; 15. Mark Whitley; 16. Thomas Van Wingerden; 17. Tony Wachter; 18. Todd Adams; 19. Daniel Moskowitz; 20. John Gottsacker. The Legends Masters Division had the fans on the edge of their seats Tuesday night. As George "Cotton" Spry took the lead from the drop of the green flag, but Spry’s win didn’t come easy as Clay Hair was on Spry’s tail for most of the race. The two put on a great show as they went nose to tail for most of the race. Hair finished up second, but kicked himself for not moving Spry out of the way earlier in the race. The Badolero Young Guns had a wild race with cars spinning and crashing everywhere. Cotton Spry (#16) led Clay Hair (#29) for the entire Legends Masters Division race. happened with that big wreck that got Wallace was ‘someone got into somebody and the results will be on TV this November. That was a wild one but we survived and got second. Results: 1. Austin Hill; 2. Clint King; 3. Nicholas Stroupe; 4. Jordan Phillips; 5. Stephen Bergh Jr.; 6. Ronnie Bassett Jr.; 7. Tommy Hill; 8. Max Gresham; 9. Bodie Bellinger; 10. Corey Gordon; 11. Tyler Hill; 12. Matt Wallace; 13. Andre Prescott; 14. Blake Eden; 15. William Nelson; 16. Will Baker; 17. Gerald White Jr. 18. Casey LaJoie; 19. Darrell Wallace Jr.; 20. Landon Bullock; 21. Josh Williams; 22. Derrick Ramey; 23. 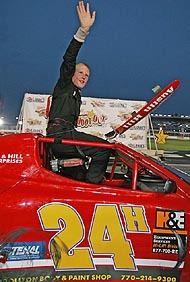 Dillon Bassett; 24. Robert Poole; 25. Ryan Blaney; 26. Brock Newsom; 27. Sammy Jasper; 28. Dax Triplett. Austin Hill used patience to win the Bandits race as he survived a wild and crazy race. Darrell Wallace Jr looked like he was on his way to another victory when he got caught up in a multi-car wreck, opening the door for Hill, who waiting for the right time to make his move for the lead. Hill capitalized on the opportunity and fended off Clint King to seal the win with two laps to go. King came from the fifth starting spot to earn himself a second-place finish on the night. It was another wild and crazy 15-lap finale for the CRASHCars that saw Gene Loden captures his very first win in Crash Car competition. Speedway officials threw an extra wrinkle into the mix allowing the car that rolled second under the checkered flag to claim the victory. After three cars slowed in an effort to take second place, officials had to review digital video to determine the winner. Loden got the call in his No. 8 Salvage machine as the perennial dirt-track winner notched his first asphalt victory. victory lane. After starting in the fourth spot, Beattie didn’t waste any time making his way to the front of the pack as he took the lead by lap five and never looked back. Tim Keener looked strong early on in the race, as he led from the start, but the handling of his car went away and he was able to salvage a second-place finish. Results. 1. Kyle Beattie; 2. Tim Keener; 3. Eric Redmond; 4. Jason Haynes; 5. Dawn Eagens; 6. Randy Spencer; 7. Chris Morgan; 8. Artie Clever; 9. Ryan Jernigan; 10. Jennifer Spain; 11. Robin Metdepenningen; 12. Benny Mingo; 13. Kara Clarke; 14. Tyler Winters; 15. Ryan Salomon; 16. Charles Long Jr.; 17. 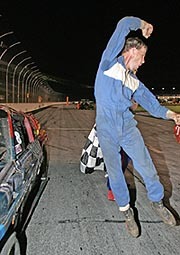 Charles Long Sr.
Gene Loden was just a little happy after his CRASHCar win.